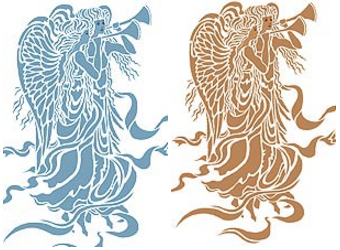 The Large Christmas Angels Stencil is a beautiful large stencil design of two trumpeting angels, with detailed wings and swirling angel robes. 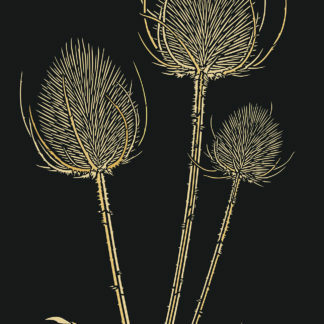 Use this lovely stencil design to add a touch of festive luxury and quality to your seasonal decorations. 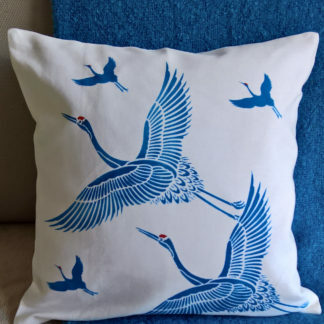 It also makes a beautiful gift for someone special. 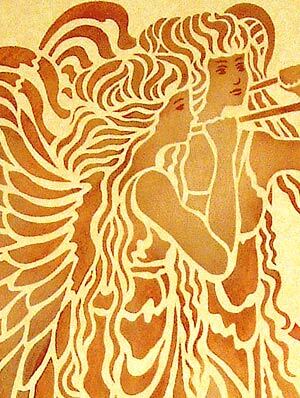 The Large Angels are beautiful in gold on paper for gift wrap, or on table covers for special meals, as well as on fabric for Christmas throws and attached to plain curtains, or as voile panels to add a little festive opulence to your Christmas decorations. 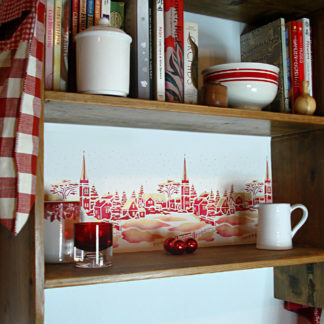 This stencil also works beautifully on window panes and mirror glass in frosted finishes. 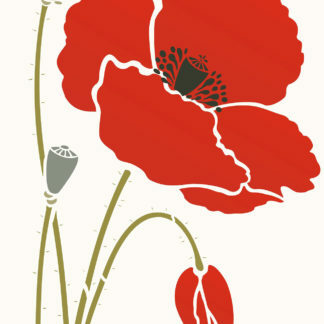 Use this large design both as an individual single motif, or as a repeated pattern motif. 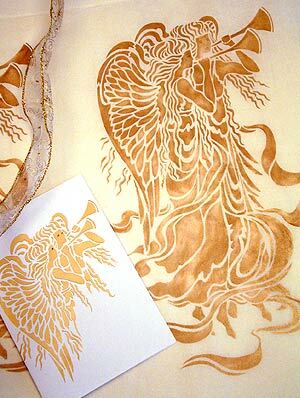 Above top – the Large Angels stencilled in Chocolat, Sienna and Seville Orange Stencil Paints on quality parchment paper. 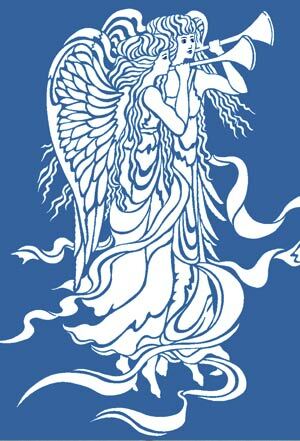 Above and below – the Large Angels stencilled in Ice White on deep blue and raspberry backgrounds. Try the Motif range of Metallic and Glitter Stencil Paints to add extra sparkle and lustre to your creations! 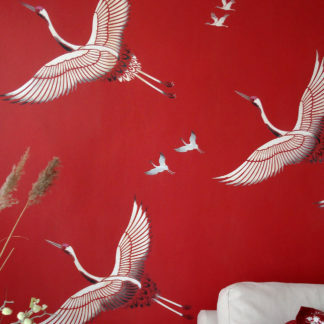 Use the Small Angels Stencil and Mini Angels Stencil to complement this design and see the simpler Large Simple Angels Stencil. Above – close up details of the Large Angels stencilled in Harvest Gold and Sienna Stencil Paints. 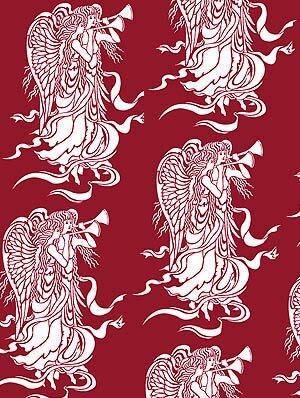 Above – the Large Angels are used to create luxurious wrapping paper. 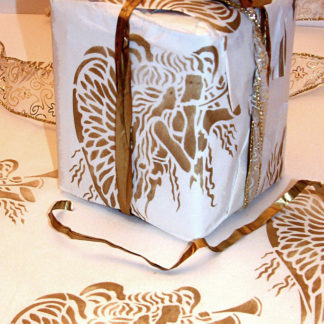 Tissue wrapping paper stencilled in Latte Stencil Paint over-stencilled with Antique Gold Metallic Stencil paint. 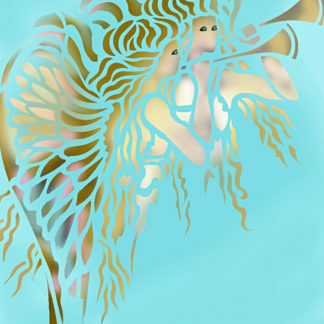 Large A5 gift card stencilled Small Angels Stencil in Antique Gold Metallic Stencil Paint. 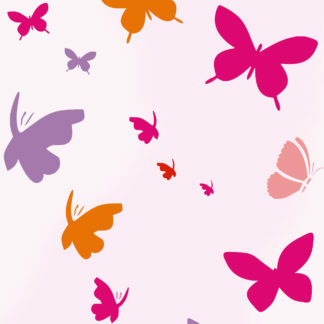 Use Mini Angels Stencil for small cards – see left. 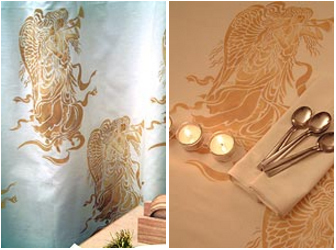 Above – the Angels are used to create a table cover for a festive candlelit dinner and a curtain panel Gold Fabric Paint. 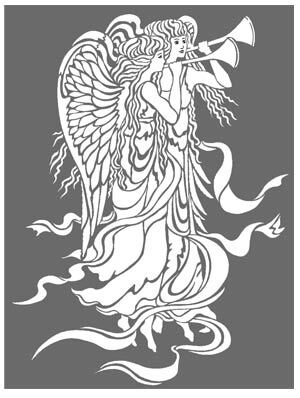 The Large Christmas Angels stencil is a one layer stencil with a separate face detail layer. On 125 micron Mylar. The main angel motif measures approximately 41cm (16″) tall by 30cm (12″) at its widest points. 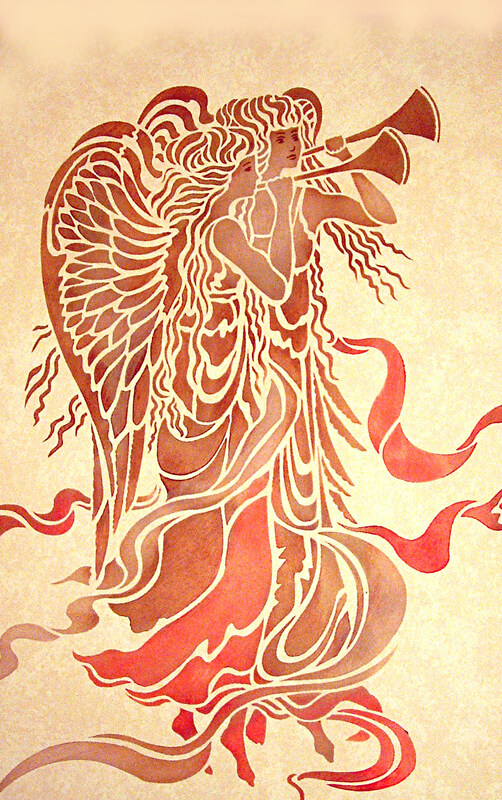 Left – layout of the Large Angels Stencil – the eye and face details come on a small separate sheet.